Published: Oct 19, 2016 to ? A very cute and sweet manga. If you're having a depressing day and want something to cheer you up, then look no further as Senryuu Shoujo will take you in with it's likable cast of characters, appealing art, and comedic story. 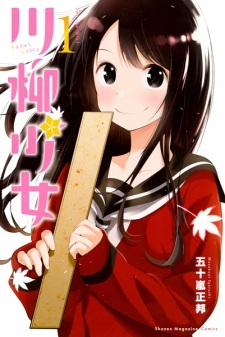 This manga is about a high school girl who can only communicate through 5-7-5 (Senryu) and her delinquent-looking friend who accompanies her. It is written in 4-koma style, but it has so much to show. The main heroine is one of the cutest characters I've seen in a while. Most of it is due to her facial expressions and, coupled with the other main character, you have one of the most entertaining duos I've ever seen. The comedy, on the other hand, is spot-on and great. Facial expressions are the main source of comedy, and I will say that the author has done a fantastic job with that. The art is so simple yet so endearing. There's also bits of romance hinted but it never gets fully explored. This is the only qualm I have with the manga, but everything else is so good that it more than makes up for it. Although, I'm pretty sure the romance will get more attention later throughout the story, so don't worry about it for now. Basically, if you want something to cheer you up, this is the right manga for you. It's very simplistic but that's what makes it so good. You don't need a complex story. Just have a funny pair of characters and funny moments, and there you go. A delightful read. The MCs are as simple as it is. Nanako the cinnamon roll that will trigger your "MUST PROTECT" instinct and will always and always put her big wide smile onto her face and you can't help but to smile with her. She is always happy when she is around Eiji and vice versa, Eiji will always be at ease while around her. Both of them doesn't have much friend beside each other, so you can guess... Their relationship is so simple yet so genuine, you can't help but asking if such a couple does exist in this world. What I wondered the most is that this is not a romance series, there isn't romance tag in its genre list, and yet all I can tell from reading it is that this is everything I could ask from a romantic series. A bittersweet interaction between two cute young teenagers who are literally a heaven-made pair. No matter what you think, they are destined to be together. Truly adorable and wholesome relationship they have.